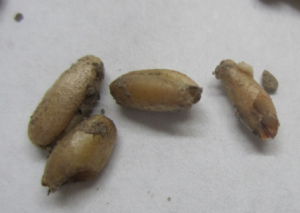 During a brief survey of recent cereal rye cover crop seedings in NW Wisconsin (Pierce, Pepin and Dunn Counties) we observed severe slug feeding on cereal rye seed that was broadcast onto the soil surface in standing corn and soybeans. This feeding was severe enough that it will undoubtedly affect establishment. The broadleaf seeds (vetch and tillage radish) appeared unaffected. 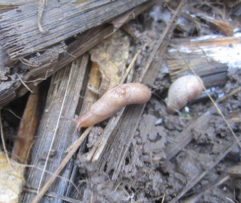 Two species of slugs (grey field slug and marsh slug) were found feeding on the “germ” (reproductive portion of the seed) leaving that area of the seed hollowed out. Common factors among all the fields with severe slug feeding was no-till and heavier soil types, which are both understandable because of the amount of residue present and moist environment. Certainly, the recent wet weather was also a factor. What was a little surprising was that early season slug damage was not noticed in some of these fields. Using a slug bait to control feeding is not a good suggestion at this point. Several factors including cost and legal issues must be well-thought-out. Before considering a bait, please read the label and make sure that application is within label, including whether the standing crop is labeled for use in Wisconsin and that PHI can be met. You must also consider whether the specie(s) of cover crop is listed on the label and the application timing/rate is acceptable for it. Labeling for the cover crop species is not required if you will not be harvesting the cover crop for forage, feed or seed (i.e., that crop does not leave the field where it was planted). This can be a lot to understand and digest at first. Another issues before considering a slug bait is that proper slug management needs to be thought about within a “systems” context, not as a quick fix. That is, short term solutions are unlikely to be effective and that several management options should be considered including, but not limited to, time of planting, planting method, crop rotation, residue management, use of insecticide seed treatment and foliar application of insecticides. Scouting is suggested prior to broadcasting cereal rye seed. Slugs can be difficult to find during daylight hours. However, scouting during cool/cloudy days can be effective but time consuming. One trick that might help is to place a flat object like a board, weighted down cardboard, paneling, etc on the soil surface. These objects provide good cover for slugs during the day and provide you with a quick method of assessing populations. The boards we used were a little over 1 sq. ft. in size and we found a range of 4-10 or more slugs/board. There are no established thresholds for slugs, however, this information can be used to help decide if drilling is a better alternative than broadcast. At this point we are unsure if other grass seeds will be similarly affected.